We are in San Diego this week for the Farmers Insurance Open at Torrey Pines. 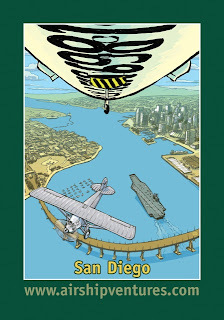 As this has become one of our regular locations, we have added San Diego to our poster art series. This is our first with the point of view being from the panoramic rear window of the gondola, and includes icons of the city such as the Coronado Bridge, aircraft carrier Ronald Reagan and the Spirit of St. Louis.